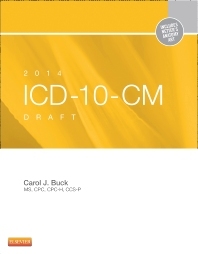 Code more efficiently and effectively with Carol J. Buck's 2014 ICD-10-CM Draft Edition. Designed by coders for coders, this reference combines Netter's Anatomy illustrations and the Official Guidelines for Coding and Reporting. It simplifies ICD-10 diagnosis to ensure the most accurate billing and optimal reimbursement for outpatient medical services. Full-color images and clear explanations of A&P, pathology, and medical terminology make it easy to develop the knowledge needed to assign the appropriate ICD-10-CM codes. At-a-glance Guide to the Updates lists all new and revised codes, providing quick access to the annual changes. Unique! Full-color Netter’s anatomy art is cross-referenced within the Tabular List to help you understand anatomy and how it will affect choosing codes. More than 150 full-color illustrations provide visual orientation and help you understand difficult terminology, diseases/conditions, or coding in a specific category. Additional elements within specific codes define terms and supply additional coding instruction to aid in understanding difficult terminology, diseases and conditions, or coding in a specific category. Symbols and highlights show which codes are an Unacceptable Principle Diagnosis and identify codes that call for the use of additional character(s).